Arrive in Paris and check in to your hotel. The balance of the day is yours to start exploring this beautiful city. Day at Leisure.Spend the remainder of the day exploring the world-class museums, beautiful architecture and local culture on your own. 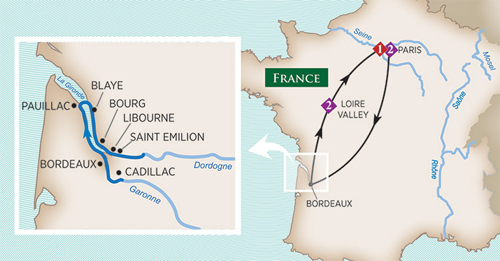 (B)"
"Check out of your hotel in the morning, and board a TGV high-speed train that will take you straight to the legendary land of wine blends and monumental architecture - Bordeaux. Arrive atyour luxurious ship, where you will gather this evening for a Welcome Dinner. (B,L,D)"
which was initially built in the 10th century by Charlemagne as his army advanced toward the Pyrenees. This evening, the ship departs for Pauillac. (B,L,D)"
origin which signifies where grapes are grown), Pauillac's gravelly soils are renowned for producing some of the world's finest Bordeaux wines - especially those made from the Merlot grape variety. You'll be able to dabble in local blends this afternoon at an authentic Medoc wine tasting. Return to the ship for a wonderful dinner, and then spend the evening as you please - we will be docked in Pauillac overnight. (B,L,D)"
to enjoy an excursion to the city's 17th century citadel - a UNESCO World Heritage Site - which was built by famous military engineer Major Vaubon. From the top of this famous fortress, you can admire fantastic views of the impressive Gironde estuary. Return to the ship for a delicious lunch and prepare for an afternoon in Bourg. Ideally situated at the confluence of the Dordogne and Garonne, this historic village still lives inside medieval walls. Built during Roman times and later fortified by the English, it is filled with rich architectural tradition. Here, you'll be able to see the home of legendary French corsair, Jean Bart. The ship with remain overnight in Bourg. (B,L,D)"
celebrated landscapes in Pomerol. The ship moors overnight in Libourne. (B,L,D)"
cruise of this magical city. (B,L,D)"
tasting at the wine museum. 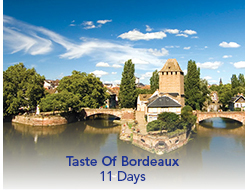 An optional tour will also be available for those who wish to see Cognac, a place bestknown for its unique, double-distilled spirit and six prominent AOCs. Tonight, the ship will stay in Bordeaux. (B,L,D)"
Disembark your ship in Bordeaux and depart for Paris. Overnight in Paris. (B)"
Please call 800.421.5643 for 2017/2018 dates and rates.